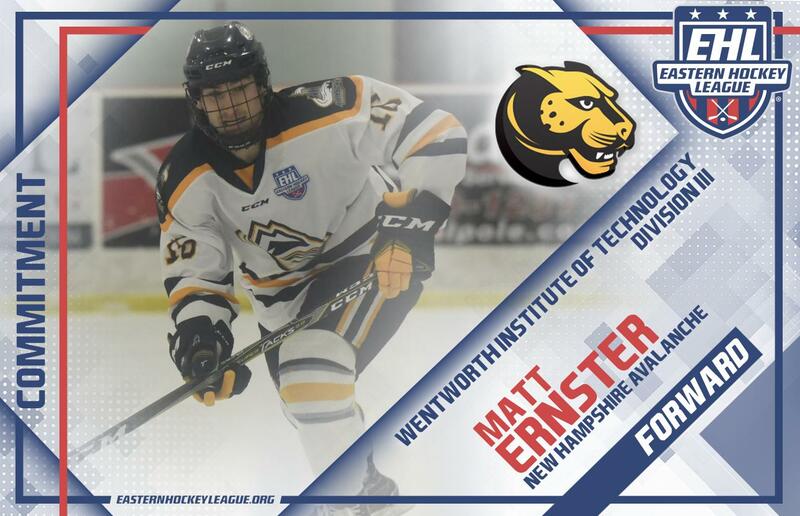 HOOKSETT, NH -- Matt Ernster, a forward for the New Hampshire Avalanche, has committed to the Wentworth Institute of Technology for the fall of 2019. The '98 native of Barrington, RI is in his first season with the Avalanche, and to date, he's tallied 21 points through 29 total games in the Eastern Hockey League (EHL). "I think this is a great fit for Matt both on the ice and in the classroom," said Avalanche head coach and general manager Chris Cerrella. "He wanted engineering and that is what Wentworth is known for, and the Wentworth coaching staff is very excited about bringing Matt in next season. I think he is going to be a very successful college hockey player and a great addition to the Wentworth community. We wish Erny nothing but the best of luck in the future." As Cerrella mentioned, the Wentworth coaching staff is excited about the addition of Ernster, which is the same way they've felt about the 15 other EHL players they've committed since the league was formed back in 2013. Ernster is the first player to make this decision during the 2018-19 season, and he keeps the streak going of at least one commit per year for the past six seasons. "I am very excited to be a part of Wentworth's academic and athletic community in the years to come," said Ernster. "I would like to thank Coach Cerrella and Coach Martiniello for helping me through the process and giving me the insight I needed to make the right choice. I would like to thank my family and friends for supporting me throughout my hockey career as well as my past coaches who have all helped me develop as a player and person." Ernster and the Avalanche are close to clinching the North Division of the New England Conference, and they will try to officially secure their First Round bye with matchups this week against the Vermont Lumberjacks and the Boston Jr. Rangers.